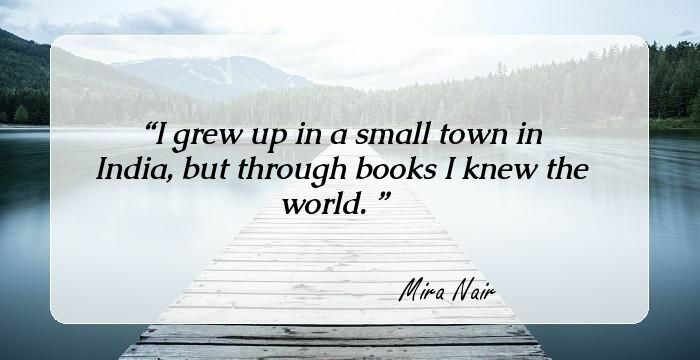 18 Inspirational Quotes From Mira Nair, The Maker Of Films Like Salaam Bombay, That Will Change Your Take On Indian Society. 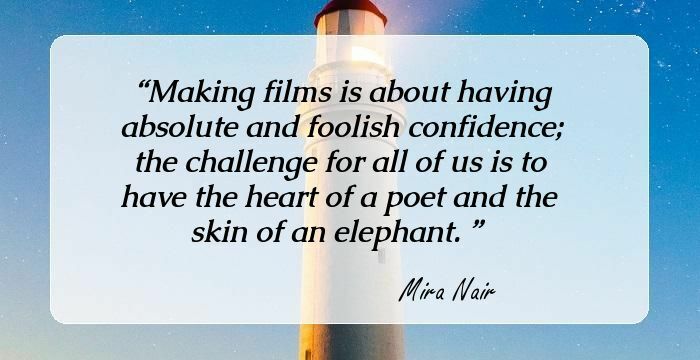 Mira Nair is an American filmmaker of Indian origin who has directed several award winning movies like ‘Salaam Bombay!’ and ‘Monsoon Wedding’. The talented director also owns a production house by the name Mirabai Films. The films she directs and produces draw inspiration from the issues prevalent in India. Mira was not the one to conform to the standards of society. While her friends from University were starting families of her own she decided to take the road less taken. Even before she had completed her graduation from Harvard she began dabbling with the niches of filmmaking. Here are a few titbits about the highly successful director. As a graduate student she created a documentary on the traditions and rituals in Islam. The Jama Masjid Street Journal remains one of the most well-crafted documentary on Islamic customs. Her mettle as a filmmaker was proved when Salaam Bombay!, the movie with which Nair made her directorial debut won the prestigious Camera D'Or and the Prix du Publique (for most popular entry) at the Cannes. Nair's stellar reputation has led to collaboration with Hollywood giants such as Hillary Swank and Denzel Washington. Mirabai Films conduct an annual event named Maisha to promote east African and Indian filmmakers and artists. Monsoon Wedding which was a commercial success and even garnered much appraise from critics was shot in a span of just 30 days. 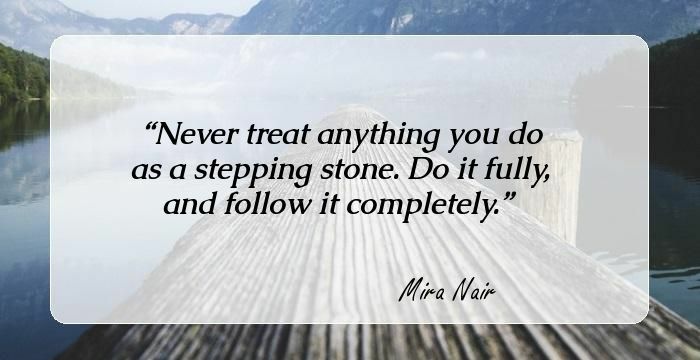 Never treat anything you do as a stepping stone. Do it fully, and follow it completely. Making films is about having absolute and foolish confidence; the challenge for all of us is to have the heart of a poet and the skin of an elephant. My family is almost exactly like the one in 'Monsoon Wedding'. We are very open, fairly liberal, loud people. Every film is a political act; it's how you see the world. Christmas lights may be the loneliest thing for me, especially if you mix them up with reindeers and sleighs. I feel alone. I feel isolated. I feel I do not belong. 'Salaam Bombay' didn't put a halo on the poor. Instead, it said that they will teach us how to live. Every frame and every scene has to have an intention. I want to question what the outside is and who defines it. I often find those that are considered to be on the outside extremely inspiring. If we don't tell our own stories, no one else will. Humility is not a trait I often associate with America. It took me three years to learn to dress in the American way, especially in winter. That was just like me. I barely wear socks even now. In our house we say 'adolescence' is a western word. We don't believe in it. It's only at this age that I can say the word 'art' without flinching. Never take no for answer, and try to make films that turn you on. Truth is much stranger than fiction and, often, much more powerful. 20 Thought-Provoking Quotes By Kajol The Queen Of Romance In Indian Cinema That Will Make You Admire Her Even More. 17 Motivational Quotes By Raj Kapoor, The Showman, That Will Inspire You To Follow Your Dreams With Tenacity. 16 Motivational Quotes By Madhuri Dixit The Diva Of Silver Screen That Will Change Your Perspective Towards Stardom. 31 Inspirational Quotes By M. N. Shyamalan Maker Of Films Like Signs And Sixth Sense That Will Stir Your Gray Cells.